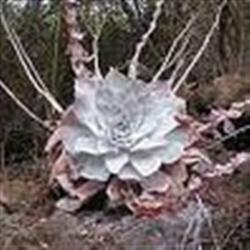 A light gray-green succulent that forms a flat rosette up to 12" in diameter. It is covered with a coating of chalky-white dust, hence its common name .Pink to deep red flowers are borne on stalks 1'-3' tall in late spring. This most beautiful Dudleya grows naturally in rocky nooks and crannies and will require well- draining soil. This is an ideal plant for rock gardens, containers or as a border plant and for green roofs. Plant on a slight angle to allow water to drain off.